Correct watering is as vital as temperature in order for orchids to thrive. Tap water is satisfactory to use unless you live in an area where the water is “hard” which means that it contains lime salts causing alkalinity that some orchids detest. If your kettle or toilet requires lime de-scaling then you are living in a hard water area and it is best to use rainwater instead to water your orchids. Generally tropical epiphytic orchids potted up with bark chippings should be kept well watered in the summer but crucially remembering to allow them to almost dry out between each watering. During an average summer watering is usually performed weekly or even more frequently if it is very warm. Note orchids grown in clay pots dry out quicker and orchids grown on cork slabs dry out even more rapidly and in the later case it may have to be done daily. Orchids from the monsoon regions such as Dendrobiums and Coelogynes really enjoy being drenched during the summer. The watering frequency described should continue until the new growths are mature and pseudobulbs, if present, are fully plump. This can take until the end of October. By then, watering should be reduced to once every 3 to 4 weeks. In fact many orchids for example Cattleyas and Barkerias require a winter rest with no watering until the new green root tips appear the following spring. When watering always do so from the top and allow the water to drain through. Never allow the plant to sit in a water filled tray as it will rot the roots. Orchid genera such as Phragmipedium and Disa are rare exceptions in that they require continual moisture at their roots but the water in these cases has to kept constantly fresh to emulate the water flowing through the bog of their native habitat. Consult Jay Pfahl’s online internet orchid encyclopaedia for guidelines on watering your particular plant. Epiphytic orchids growing on trees in the tropics as well as many of our Irish native terrestrials have had to adapt to low nutrient environments. It is untrue that supplying high levels of fertiliser will result in bigger, faster growing plants as would be the case in the cultivation of many house plants or vegetables. In fact salt build up from over fertilising is harmful to orchids. Symptomatically this is indicated by blackened leaf tips brought about indirectly by root death. However fertilisers used at the right concentration are beneficial. During the summer, high nitrogen fertilisers can be used to bolster vegetative growth. In the autumn the fertiliser can be switched to one which is high in potassium to encourage flower spike development. However both must but must be used at a concentration of no more than a quarter of the strength recommended for other plants by the fertiliser manufacturer. There are exceptions, Cymbidiums are gross feeders and require higher amounts of fertiliser for their strong shoots. Conversely, Disas and most native orchids are very sensitive to even low levels of fertilisers and should only be used as advised by specialist growers. In all cases after about every third watering with fertiliser it is recommended to water once without so as to wash out residual salts. There are now several fertilisers specifically formulated for orchids available in garden centres and these should be the ones of choice for you. 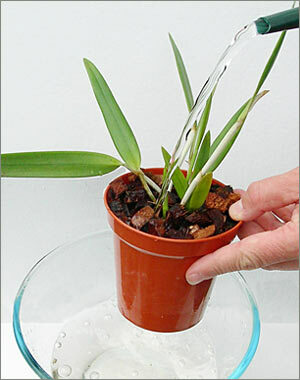 Always water an orchid from the top surface and allow to drain through. Never leave your orchid in a tray of water, otherwise the roots will rot.